A while ago I saw two novels by Luke McCallin on a promotion and, in a fit of ‘why notness’ I bought them. The thing is, I may be solidly rooted in ancient history with most of my reading there, but every now and then I’m partial to a little World War 2 fiction. Michael Ridpath’s ‘Traitor’s Gate’ made it into my annual top 10. And I rather liked the look of a murder investigation in a WW2 setting. First off, this is a novel with a fascinating and I might even hazard ‘unique’ viewpoint. Few works of fiction choose to take a member of the wartime German forces as a protagonist. Yes, I’ve seen a few, but not many. Because it’s a brave novelist who takes it on. Because there is a very fine line to walk with it. It’s hard to make the character sympathetic to a modern non-German, I think, because of inherent prejudices born of half a century of ‘White hat – black hat’ thinking. And if you try to make him too sympathetic you run the risk of losing credibility with the character. In that respect, McCallin has hit the sweet spot. Reinherdt is very realistic, and yet sympathetic. More so, I think, even than Ridpath’s hero. In fact as a character he reminds me of Korolev in William Ryan’s pre-war Russian thrillers. And perhaps a word then about setting. Because in WW2 stories we are very familiar with England, France, Germany and Russia as settings. We’ve also seen North Africa, and on occasion Italy, and Greece. Yugoslavia is a new one on me, and really an incredibly rich and complex setting, with the territory itself almost torn apart by internecine wars, completely ignoring the Germans in overall control. Then there are Italians present, partisans, British in threat form at least. And Orthodox, Muslim and Catholic. And everyone hates everyone else. McCallin does an excellent job of painting 40s Yugoslavia. I wonder if he has spent time there? It certainly felt like he knew the place well. The plot, then. We are immediately presented with a murder case which is given to Reinhardt as a member of the Abwehr to solve, because while one of the victims is a wealthy, spoilt, man-eating female local journalist, the other is also a German officer of the Abwehr. I have to admit that I was half way through the book before the investigation really picked up pace and we began to discover what was going on, but that was not a fault. The investigation is endlessly messed around with for political, personal and ethnic purposes and it is only when Reinhardt becomes truly galvanised in his role that things pick up speed. The plot is almost as complex as the setting and gives us something of an insight into just how difficult and labyrinthine the internal politics of wartime Germany and the wehrmacht actually were. All in all, the novel was intricate, fascinating, and kept dragging me back. It is not the most pacy novel I’ve read, with some parts feeling a little languid, but when the action comes, it comes thick, fast and unforgiving. Similarly, while there are times when I felt the plot becoming a little muddled, all comes out well and the ending is very satisfying. And like all good whodunnits, many of the things that slip past early on as not vastly important actually do in the end have a place in the tale and a bearing on the case. So the upshot is that as soon as I have the time, I shall be reading the second Gregor Reinhardt novel. If you have any interest in the war, or in complex murder investigations – and certainly if both – then you might well want to give the Man from Berlin a try. An absorbing read. An unusual review of a little gem for you today. As you know I occasionally like to review the odd non-fiction work among the novels I read. Well the other day I came into possession of a copy of Facts about Fritz by Robin Schafer and Tim Hardy. Rob is a German military historian and consultant (and without doubt the most knowledgeable such I have ever come across) and Tim is a talented graphic designer. Together they have combined their skills to release this wonderful item. If, like me, you have a passing knowledge of the First World War, mostly gained through school, holidays in northern Europe… and Blackadder, of course… then this book might prove as fascinating and informative to you as it does to me. If you are already an expert, it is pitched a little below your level to be honest, but that doesn’t mean it’s not worth having. Far from it. to letters written by the men at the front, to lengthy paragraphs detailing for instance the Reich’s Postal Service, to extracts from contemporary tales. All interspersed with appropriate imagery. Subjects covered include such wide-ranging matters as the Iron Cross, Flags, Trench Newspapers and the Flying Circus. The book is an objective and factual work on the army of the Kaiser’s Germany and should be fascinating to anyone who has even a passing interest in the era. The book costs £7.99 and is currently only available through Tim Hardy’s website HERE. I would also urge you to keep an eye on Rob’s site – as well as being fascinating in general, he has another book on Fritz and Tommy coming out next year through the History Press and that will be worth grabbing. Today I’m going to direct your attention to another writer of historical fiction. This one, however, writes a little different from the people I’ve steered my friends & readers towards previously. Anyone who knows me knows that I’m so heavily-based in Rome and the ancient world that I can barely even think in terms of anything after the end of Byzantium and that the modern world gives me a faint case of the heeby jeebies. I’ve recently expanded my reading outside the confines of the empire, however, taking in the viking writings of Giles Kristian and the brutal Robin Hoodiness of Angus Donald (both of whom I will be revisiting soon, so watch this space.) The furthest from my comfort zone, though, has to be Harvey Black. I bumped into Harvey courtesy of twitter (where I have to admit that I’m considerably more prolific than I am here, though no less daft.) Through our nodding acquaintance and off the cuff, so to speak, I bought Harvey’s first book, Devils With Wings. No, this is no Stephanie Meyer-esque sucky gothy horror work. Nor is it about moths, which, my mother tries to convince me are said Devils. No. Devils with Wings, in fact, is as far removed from the doom-ridden Twiglet series as it is from my normal comfort zone. It is, in fact, a novel about the Fallschirmjäger, the elite Green Devils paratroop regiment of the German military in the Second World War. Given everything you know about me, here’s the big surprise, then. I really enjoyed it. I enjoyed it enough that I’ll happily recommend it to you guys. Moreover, I enjoyed it enough that I have the sequel: Silk Drop, sitting next up in my pile of books to read. Tall, gangly Paul Brand is supported by his junior sergeant, Unterfeldwebel Max Grun, as he experiences his first action as a platoon commander in Poland, September 1939. The mutual respect between the two comrades grows as they experience the sights and smells of battle at close quarters Following their success in Poland, Paul, Max and the platoon are sent to a clandestine camp in the foothills of the Harz Mountains to train for a secret mission. Confined to camp for six months they undergo intensive training for their next mission – the subjugation of the Eben Emael Fortress. Two German secret weapons will assist them to complete their task; the first is the glider, used for the first time to deposit troops directly onto a target, and the second secret weapon is a new Hollow Charge Weapon, capable of blasting through steel or concrete. On completion of their training, nine gliders containing seventy two Fallschirmjager land on top of the fortress, before the troops move in to the depths of the tunnels to finish the job. Over one thousand Belgian troops fail to stop them. This exciting fictionalised retelling of the assault on Eben Emael is written by an author with experience in army intelligence. And in my own words: Devils with Wings is a tight story with some very engaging characters, packed with action and adventure, telling the events that surrounded the first strike of Germany into the western front, in Belgium. It is an event about which I had previously no knowledge and therefore was new and interesting. For me, the high point is the tense approach to the main mission in rickety gliders. More to come on that. I fear there may be some out there who would be put off by the fact that this is a story of a German wartime unit. To you, I would say, Pah! Do not be. We are all aware that, despite that diminutive psycopath with the oily hair and ‘tache and his close cadre of genocidal knobheads, there were a number of men and women in wartime Germany that were not murder loving Nazis but rather real, ordinary people with a job to do, with families, dreams and aspirations and, yes, honour. This story is about them and Harvey deserves, I think, a certain respect for telling such a tale. 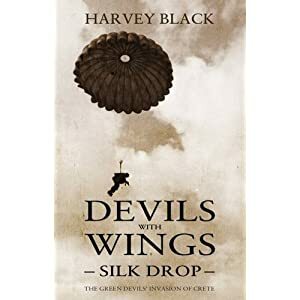 Finishing Devils With Wings merely made me want to read Silk Drop. Fourthly, I shall barrage you with a selection of appropriate links, on the understanding, and in the knowledge, that you will click at least two and peruse them, or my hords of flying plasma-cannon monkeys will seek you out and fling poo at you.